Wireless Bluetooth QWERTY Keyboard &Touchpad is an ideal combo. Just press the key icon, you can switch freely between mouse mode and figure pattern. Support systems: Windows, Mac/IOS, Android, Tablet PC, Smart Phone ,enabling you to match with any bluetooth-enabled devices Touchpad mouse function is not suit for MAC or IOS. With bluetooth wireless technology, there is no messy cables anymore,providing a hassle-free wireless experience.What's more, Wireless Bluetooth QWERTY keyboard with ergonomic tilted design reduces wrist strain. Sleek profile,easy to transport,work and play anywhere anytime. 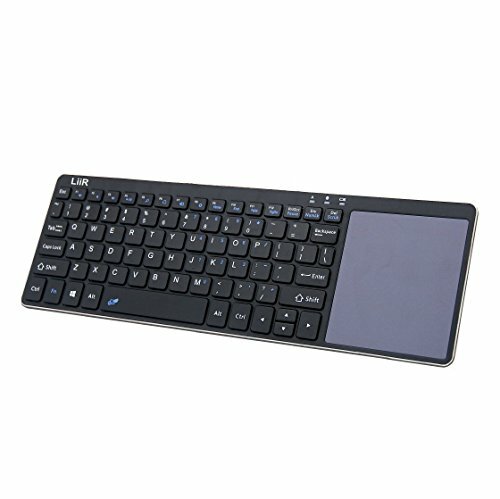 We stand behind our bluetooth keyboard 100% therefore we back this bluetooth keyboard 12 months guarantee.If you have any problems with our bluetooth keyboard we will replace it no questions asked. Purchase 1byone now and rest satisfied that a great product is on its way! You'll be thankful that you made such a great purchase. 1. This keyboard Bluetooth 3.0 conection. 2. Keyboard layout 80keys may not light,but will still function normally. 3. Working distance:10m;Power supply:AAA x 2 Dry batttery. 4.When connecting the keyboard with a PC, please note that a bluetooth receiver is required (Not Included). Connecting the device with a tablet, smartphone or any bluetooth device does not require a separate receiver. I. The keyboard may in sleep mode. Normally, the keyboard will auto in sleep mode in 10 min without any operation. In this case, please just press any key to make the keyboard begin to work. II. The touchpad may closed. Please press FN + Space at the same time to unlock the Touchad. Then, the touchpad will start to work. If you have any questions about this product by LiiR, contact us by completing and submitting the form below. If you are looking for a specif part number, please include it with your message.